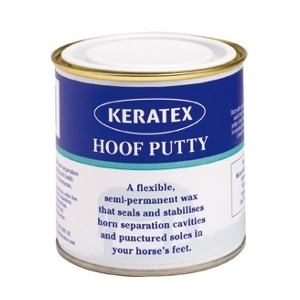 Keratex Hoof Putty is great for repairing holes in the soles of a horse's feet, enabling the owner to turn out with confidence after the cavity has been plugged with Hoof Putty. 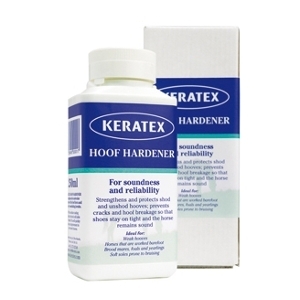 Keratex Hoof Hardener formula is patented and includes a unique flexibility agent as well as a hardening agent, making this the perfect product to protect your horse from: brittle, cracked, soft or weak hooves; soft, sensitive or thin soles; repeated shoe loss; transition to barefoot; hoof damage. 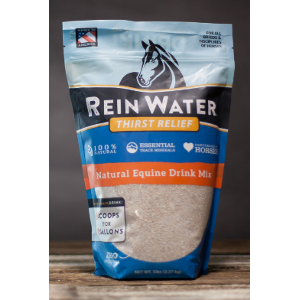 Rein Water™ is an all natural powder drink additive that encourages horses to drink more while providing them with natural electrolytes. The natural ingredients come from Redmond’s mineral deposits in Central Utah and are brought to you in their natural, unrefined state, full of beneficial minerals. 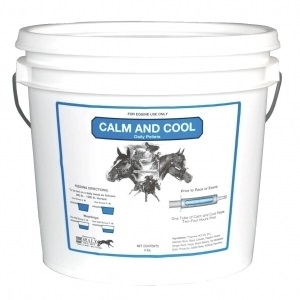 And, like every Redmond Equine product, you know your horses will get essential trace minerals and electrolytes in a natural blend only nature could have made. 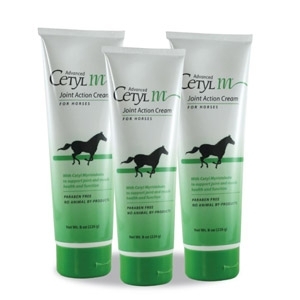 This powerful joint action cream is uniquely designed and formulated to support joint and muscle health and function in horses—and may help ease the aches and discomfort that can occur from heavy exercise, training, and competition. 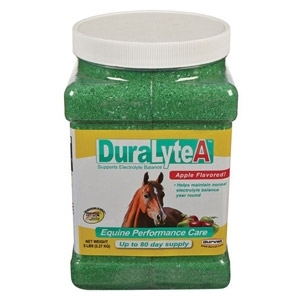 Apple flavored DuraLyte A™ is a supplement designed for the support of normal recovery time after strenuous activity and help maintain a normal electrolyte balance year round. 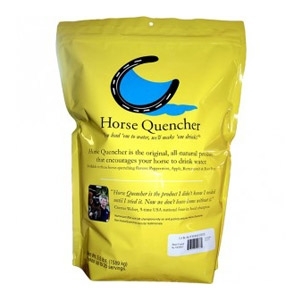 Horse Quencher is a mix of all natural grains and flavorings that, when added to water, make horses eagerly drink. You’ll find Horse Quencher especially helpful for travel, competitions, cold weather and illnesses, and also great to pair with electrolytes to aid in recovery after exercise. It’s made of all-natural ingredients found in most horse feeds, so you can be sure Horse Quencher is safe for competition. 3.5 lbs. 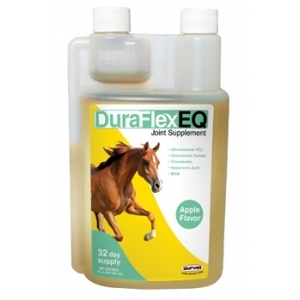 DuraFlex™EQ is for use in horses and contains easily absorbed ingredients that help support healthy connective tissue, joint structure and maintain normal joint function and mobility. 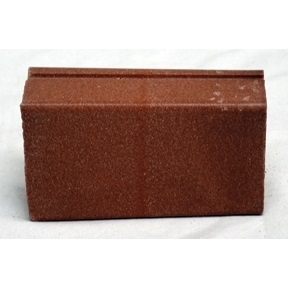 Improves hoof quality in horses with thin, crumbly hooves. 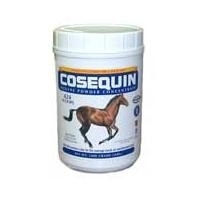 Safe for use on all horses, including pregnant and lactating mares. Measuring scoop included. Treat your horse to oven-fresh, baked cookies that are enriched with healthy ingredients. 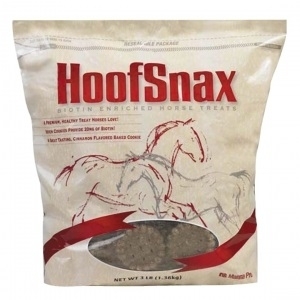 Your faithful companion will love the great tasting cinnamon flavor of hoof snax. They are made from only the finest human-quality ingredients. Special blend of herbs and essential amino acid "l-tryptophan"(essential to life and unable to be synthesized by the body). 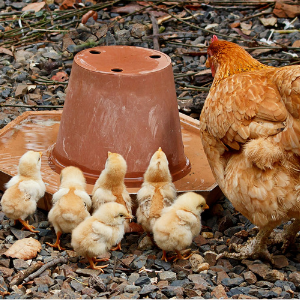 L-tryptophan is least abundant in typical animal feeds and is therefore often lacking in the diet and must be supplemented. 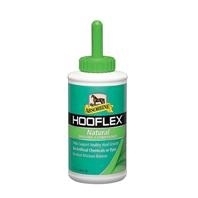 Uses herbal ingredients to stimulate circulation and improve hoof growth. First all-natural alternative made with ingredients known to help promote shiny, healthy hooves. Contains no petroleum distillates- only all-natural vegetable oils. Penetrates fast with no greasy residue. 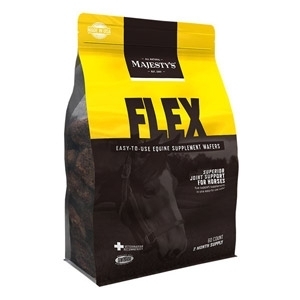 Joint supplement for horses in an easy to feed wafer (cookie). 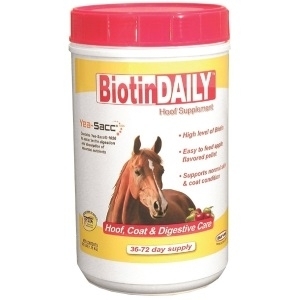 Delivers the optimum amount of joint support product to the horse, and at a low price. Two a day if loading but for no longer than 2 weeks. 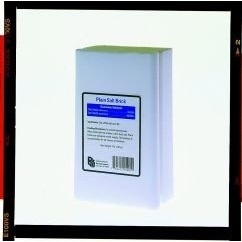 Supplements horses to provide additional high quality electrolyte salts that may be lost by dehydration. Elite electrolyte supplements horses to provide additional electrolyte salts that may be lost by dehydration. Elite electrolyte may administered in the horses feed or drinking water at the rate of 2oz per 10 gallons of fresh water. 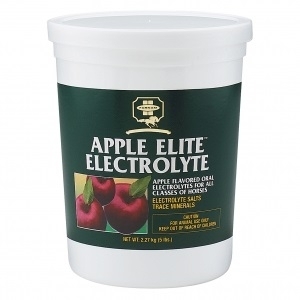 Apple-a-day electrolytes are formulated to replenish lost minerals as well as prevent dehydration. Water intake and the appetite of your horse will also increase. Feed one ounce daily. 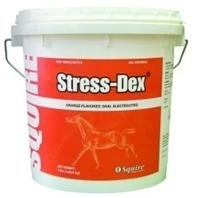 Apple-dex supplements horses to provide additional electrolyte salts that may be lost by dehydration. 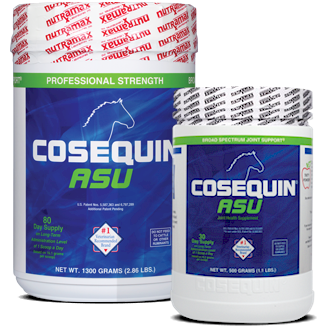 Helps replace the electrolytes active horses may lose in training/competition. 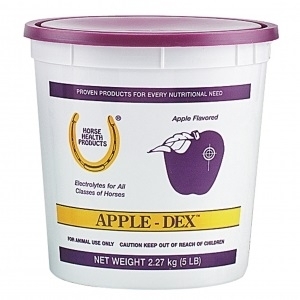 Apple-dex may be administered in the horse's feed or drinking water at the rate of 2 ounces per 10 gallons of fresh water. 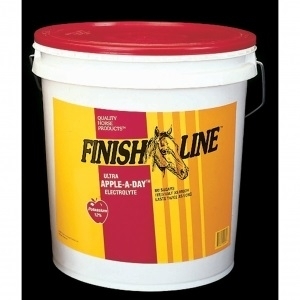 Contains the perfect blend of electrolyte salts and minerals to replenish the horse's body and prevent dehydration. Can be used daily in feed or water. Appetizing orange flavor that is loved by even the most finicky horses. 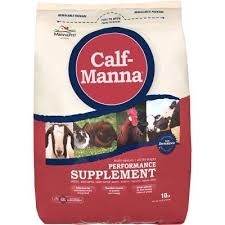 The number one veterinarian-recommended joint health supplement brand. 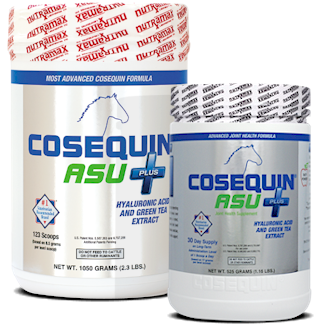 Joint function and health can be supported in your horse with the administration of cosequin. 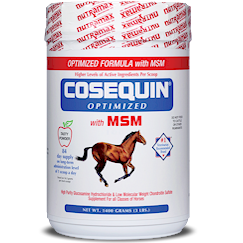 Since cosequin provides nutrients that affect the structure and function of the joint, changes may occur gradually. Recommended for all classes of livestock. Place near adequate water supply. Allow livestock free access to this feed salt. An exclusive formula designed to provide instant high gloss shine that lasts. 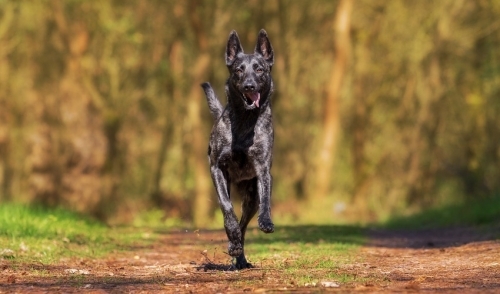 Shine-on is a ph balanced formula that repels dust and provides long lasting prevention of coat stains.